Ever since Galileo first observed it through a telescope in 1610, Jupiter and its system of moons have fascinated humanity. And while many spacecraft have visited the system in the past forty years, the majority of these missions were flybys. With the exception of the Galileo space probe, the visits of these spacecraft to the Jupiter system were one of several intended objectives, taking place before they made their way deeper into the Solar System. Having launched on August 5th, 2011, NASA’s Juno spacecraft has a different purpose in mind. Using a suite of scientific instruments, Juno will study Jupiter’s atmosphere, magnetic environment, weather patterns, and shed light on the history of its formation. In essence, it will be the first probe since the Galileo mission to orbit Jupiter, where it will spend the next two years sending information about the gas giant back to Earth. If successful, Juno will prove to be the only other long-term mission to Jupiter. However, compared to Galileo – which spent seven years in orbit around the gas giant – Juno’s mission is planned to last for just two years. However, its improved suite of instruments are expected to provide a wealth of information in that time. And barring any mission extensions, its targeted impact on the surface of Jupiter will take place in February of 2018. As part of the NASA’s New Frontiers program, the Juno mission is one of several medium-sized missions intended to explore the various bodies of the Solar System. It is currently one of three probes that NASA is operating, or in the process of building. The other two are the New Horizons probe (which flew by Pluto in 2015) and OSIRIS-REx, which is expected to fly to asteroid 101955 Bennu in 2020 and bring samples back to Earth. During a 2003 decadal survey – titled “New Frontiers in the Solar System: An Integrated Exploration Strategy” – The National Research Council discussed destinations that would serve as the source for the first competition for the New Frontiers program. A Jupiter orbiter was identified as a scientific priority, which it was hoped would address several unanswered questions pertaining to the gas giant. These included whether or not Jupiter had a central core (the research of which would help establish how the planet was formed), the water content of Jupiter’s atmosphere, how its weather systems can remain stable, and what the nature of the magnetic field and plasma surrounding Jupiter are. In 2005, Juno was selected for the New Frontiers program alongside New Horizons and OSIRIS-REx. Though it was originally intended to launch in 2009, NASA budget restrictions forced a delay until August of 2011. The probe was named in honor of the Roman goddess Juno, the wife of Jupiter (the Roman equivalent of Zeus) who was able to peer through a veil of clouds that Jupiter drew around himself. The name was previously a backronym which stood for JUpiter Near-polar Orbiter as well. The Juno mission was created for the specific purpose of studying Jupiter for the sake of learning more about the formation of the Solar System. For some time, astronomers have understood that Jupiter played an important role in the development Solar System. Like the other gas giants, it was assembled during the early stages, before our Sun had the chance to absorb or blow away the light gases in the huge cloud from which they were born. As such, Jupiter’s composition could tell us much about the early Solar System. Similarly, the gas giants are believed to have played a major role in the process of planet formation because their huge masses allowed them to shape the orbits of other objects – planets, asteroids and comets – in their planetary systems. However, for astronomers and planetary scientists, much still remains unknown about this massive gas giant. For instance, Jupiter’s interior structure and composition, as well as what drives its magnetic field, are still the subject of theory. Because Jupiter formed at the same time as the Sun, their chemical compositions should be similar, but research has shown that Jupiter has more heavy elements than our Sun (such as carbon and nitrogen). In addition, there are some unanswered questions about when and where the planet formed. While it may have formed in its current orbit, some evidence suggests that it could have formed farther from the sun before migrating inward. All of these questions, it is hoped, are things the Juno mission will answer. Having launched on August 5th, 2011, the Juno spacecraft spent the next five years in space, and will reach Jupiter on July 4th, 2018. Once in orbit, it will spend the next two years orbiting the planet a total of 37 times from pole to pole, using its scientific instruments to probe beneath the gas giant’s obscuring cloud cover. Gravity Science: Using radio waves and measuring them for Doppler effect, this instrument will measure the distribution of mass inside Jupiter to create a gravity map. Small variations in gravity along the orbital path of the probe will induce small changes in velocity. The principle investigators of this instrument are John Anderson of NASA’s Jet Propulsion Laboratory and Luciano Iess of the Sapienza University of Rome. Jovian Auroral Distribution Experiment (JADE): Using three energetic particle detectors, the JADE instrument will measure the angular distribution, energy, and velocity vector of low energy ions and electrons in the auroras of Jupiter. The PI is David McComas of the Southwest Research Institute (SwRI). Jovian Energetic Particle Detector Instrument (JEDI): Like JADE, JEDI will measure the angular distribution and the velocity vector of ions and electrons, but at high-energy and in the magnetosphere of Jupiter. The PI is Barry Mauk of NASA’s Applied Physics Laboratory. Jovian Infrared Aural Mapper (JIRAM): Operating in the near-infrared, this spectrometer will be responsible for mapping the upper layers of Jupiter’s atmosphere. By measuring the heat that is radiated outward, it will determine how water-rich clouds can float beneath the surface. It will also be able to assess the distribution of methane, water vapor, ammonia and phosphine in Jupiter’s atmosphere. Angioletta Coradini of the Italian National Institute for Astrophysics is the PI on this instrument. Magnetometer: This instrument will be used to map Jupiter’s magnetic field, determine the dynamics of the planet’s interior and determine the three-dimensional structure of the polar magnetosphere. Jack Connemey of NASA’s Goddard Space Flight Center is the instrument’s PI. Microwave Radiometer: The MR instrument will perform measurements of the electromagnetic waves that pass through the Jovian atmosphere, measuring the abundance of water and ammonia in its deep layers. In so doing, it will obtain a temperature profile at various levels and determine how deep the atmospheric circulation of Jupiter is. The PI for this instrument is Mike Janssen of the JPL. Radio and Plasma Wave Sensor (RPWS): This RPWS will measure the radio and plasma spectra in Jupiter’s auroral region. In the process, it will identify the regions of auroral currents that define the planet’s radio emissions and accelerate its auroral particles. William Kurth of the University of Iowa is the PI. Ultraviolet Imaging Spectrograph (UVS): The UVS will record the wavelength, position and arrival time of detected ultraviolet photons, providing spectral images of the UV auroral emissions in the polar magnetosphere. G. Randall Gladstone of the SwRI is the PI. In addition to its scientific suite, the Juno spacecraft also carries a commemorative plaque dedicated to Galileo Galilei. The plaque was provided by the Italian Space Agency and depicts a portrait of Galileo, as well as script that had been composed by Galileo himself on the occasion that he observed Jupiter’s four largest moons (known today as the Galilean Moons). The spacecraft also carries three Lego figurines representing Galileo, the Roman god Jupiter and his wife Juno. The figure of Juno holds a magnifying glass as a sign of her searching for the truth, Jupiter holds a lightning bolt, and the figure of Galileo Galilei holds his famous telescope. Lego made these figurines out of aluminum (instead of the usual plastic) to ensure they would survive the extreme conditions of space flight. The Juno mission launched from Cape Canaveral Air Force Station on August 5th, 2011, atop an Atlas V rocket. After approximately 1 minute and 33 seconds, the five Solid Rocket Boosters (SRBs) reached burnout and then fell away. After 4 minutes and 26 seconds after liftoff, the Atlas V main engine cut off, followed 16 seconds later by the separation of the Centaur upper stage rocket. After a burn that lasted for 6 minutes, the Centaur was put into its initial parking orbit. It coasted for approximately 30 minutes before its engine conducted a second firing which lasted for 9 minutes, putting the spacecraft on an Earth escape trajectory. About 54 minutes after launch, the spacecraft separated from the Centaur and began to extend its solar panels. A year after launch, between August and September 2012, the Juno spacecraft successfully conducted two Deep Space Maneuvers designed to correct its trajectory. The first maneuver (DSM-1) occurred on August 30th, 2012, with the main engine firing for approximately 30 minutes and altering its velocity by about 388 m/s (1396.8 km/h; 867 mph). The second maneuver (DSM-2), which had a similar duration and resulted in a similar velocity change, took place on September 14th. The two firings occurred when the probe was about 480 million km (298 million miles) from Earth, and altered the spacecraft’s speed and its Jupiter-bound trajectory, setting the stage for a gravity assist from its flyby of Earth. Juno’s Earth flyby took place on October 9th, 2013, after the spacecraft completed one elliptical orbit around the Sun. During its closest approach, the probe was at an altitude of about 560 kilometers (348 miles). The Earth flyby boosted Juno’s velocity by 3,900 m/s (14162 km/h; 8,800 mph) and placed the spacecraft on its final flight path for Jupiter. During the flyby, Juno’s Magnetic Field Investigation (MAG) instrument managed to capture some low-resolution images of the Earth and Moon. These images were taken while the Juno probe was about 966,000 km (600,000 mi) away from Earth – about three times the Earth-moon separation. They were later combined by technicians at NASA’s JPL to create the video shown above. The Earth flyby was also used as a rehearsal by the Juno science team to test some of the spacecraft’s instruments and to practice certain procedures that will be used once the probe arrives at Jupiter. The Juno spacecraft reached the Jupiter system and established polar orbit around the gas giant on July 4th, 2016. It’s orbit will be highly elliptical and will take it close to the poles – within 4,300 km (2,672 mi) – before reaching beyond the orbit of Callisto, the most distant of Jupiter’s large moons (at an average distance of 1,882,700 km or 1,169,855.5 mi). This orbit will allow the spacecraft to avoid long-term contact with Jupiter’s radiation belts, while still allowing it to perform close-up surveys of Jupiter’s polar atmosphere, magnetosphere and gravitational field. The spacecraft will spend the next two years orbiting Jupiter a total of 37 times, with each orbit taking 14 days. Already, the probe has performed measurements of Jupiter’s magnetic field. This began on June 24th when Juno crossed the bow shock just outside Jupiter’s magnetosphere, followed by it’s transit into the lower density of the Jovian magnetosphere on June 25. Having made the transition from an environment characterized by solar wind to one dominated by Jupiter’s magnetosphere, the ship’s instruments revealed some interesting information about the sudden change in particle density. The probe entered its polar elliptical orbit on July 4th after completing a 35-minute-long firing of the main engine, known as Jupiter Orbital Insertion (or JOI). As the probe approached Jupiter from above its north pole, it was afforded a view of the Jovian system, which it took a final picture of before commencing JOI. 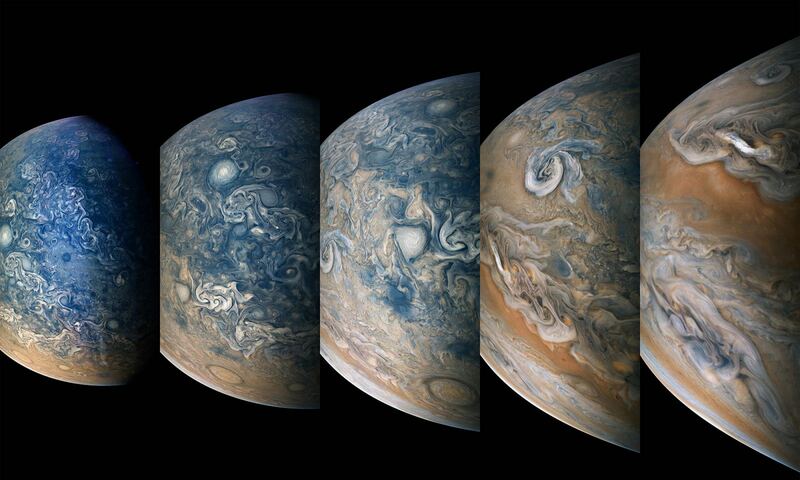 On July 10th, the Juno probe transmitted its first imagery from orbit after powering back up its suite of scientific instruments. The images were taken when the spacecraft was 4.3 million km (2.7 million mi) from Jupiter and on the outbound leg of its initial 53.5-day capture orbit. The color image shows atmospheric features on Jupiter, including the famous Great Red Spot, and three of the massive planet’s four largest moons – Io, Europa and Ganymede, from left to right in the image. While the mission team had hoped to reduce Juno’s orbital period to 14 days, thus allowing for it to conduct a total of 37 perijoves before mission’s end. However, due to a malfunction with the probe’s helium valves, the firing was delayed. NASA has since announced that it will not conduct this engine firing, and that the probe will conduct a total perijoves in total before the end of its mission. The Juno mission is set to conclude in February of 2018, after completing 12 orbits of Jupiter. At this point, and barring any mission extensions, the probe will be de-orbited to burn up in Jupiter’s outer atmosphere. As with the Galileo spacecraft, this is meant be to avoid any possibility of impact and biological contamination with one of Jupiter’s moons. The mission is managed by the JPL, and its principal investigator is Scott Bolton of the Southwest Research Institute. NASA’s Launch Services Program, located at the Kennedy Space Center in Florida, is responsible for managing launch services for the probe. The Juno mission is part of the New Frontiers Program managed by NASA’s Marshall Space Flight Center in Huntsville, Ala.
As of the writing of this article, the Juno mission is one day, four hours and fifty-five minutes away from its historic arrival with Jupiter. Check out NASA’s Juno mission page to get up-to-date information on the mission, and stay tuned to Universe Today for updates! We have written many interesting articles about Jupiter here at Universe today. Here’s Juno Blasts off on Science Trek to Discover Jupiter’s Genesis, Jupiter Bound Juno snaps Dazzling Gallery of Planet Earth Portraits, Understanding Juno’s Orbit: An Interview with NASA’s Scott Bolton, NASA’s Juno probe Gets Gravity Speed Boost during Earth Flyby But Enters ‘Safe Mode. For more information, check out NASA’s Juno mission page, and the Southwest Research Institute’s Juno page.